It has been nearly a week since the Flying Feeder Birds Diabolical Quiz was posted so I offer my apologies for the slightly late posting of the answers. Though, in my defense, not many of our usually intrepid 10,000 Birds readers dared to guess the identities of the birds in the three images provided. Oh well, as was kind of expected, one of the readers that did dare to guess managed to get all three correct and earn the accolades of all who have experienced a diabolical quiz. Jochen, take a bow! Now let us delve into each individual picture and see who did what right where. Both images number one and number three were not only of the same species but of the same individual, and were taken less than a second apart. 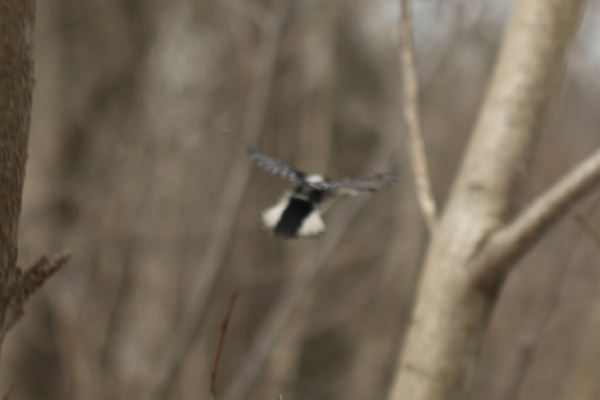 The two images, of which the second was actually taken first, show a Downy Woodpecker diving off of one tree and then pulling up to land on another. 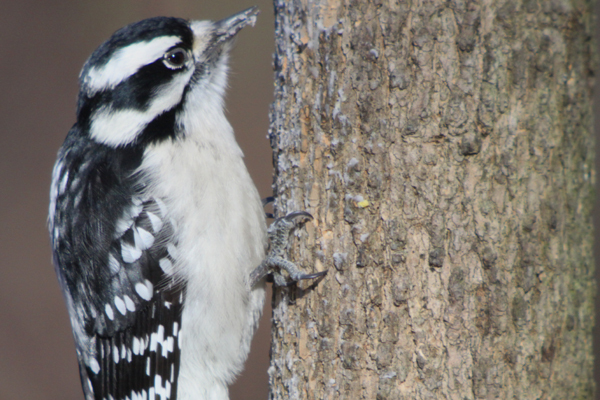 In addition to Jochen (who, by the way, initially thought the latter picture was a White-breasted Nuthatch), Adam Z managed to get the last picture correct, though, like Nate, he thought the first picture showed a Hairy Woodpecker. Wren, of course, was just kidding with her guesses, but I think I should admit that no, I did not photograph any extinct species for this quiz, so Ivory-billed Woodpecker and Dusky Seaside Sparrow were not correct guesses. 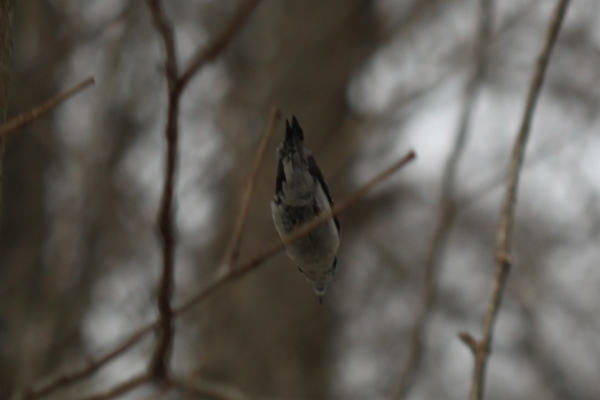 This leaves us with only the second diabolical flying feeder bird image. Everyone who guessed managed to get it correct (well, except for Wren, who thought it might be Bachman’s Warbler). 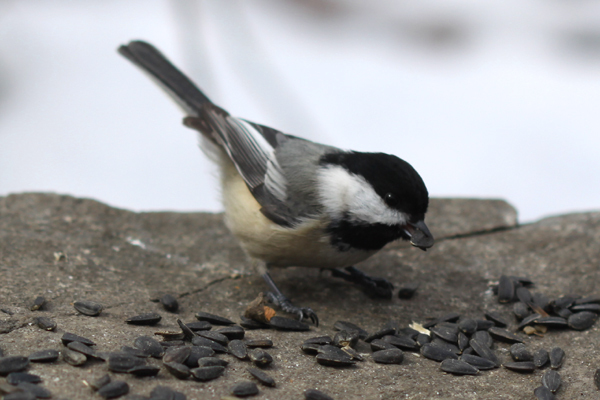 Of course, the bird is a Black-capped Chickadee. Congrats to Nate who guessed it first and to Adam Z and Jochen who recognized Nate’s genius and stuck with his answer. Thanks again to those who guessed. And to those that did not guess, well, I understand your fear of the diabolicalness, but, really, you have nothing to fear…make sure to guess next time! Dang! That was diabolical. Two pictures of the same bird. Good work, and I’ll do better next time. @Adam Z: Glad you liked it…we don’t call ’em diabolical for nothing! Yes it is true, I’d be a big ol’ NOTHING in the diabolical bird ID quizz world if I had to try and answer before Nate. 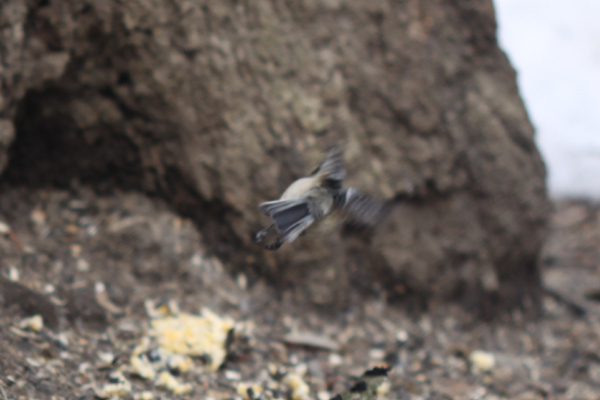 However, this time Nate screwed it up for me as well as I simply followed his Nuthatch ID without even taking as much as a casual glance at the tail of the bird. So, thanks for announcing me sort of the winner, but as I got it wrong on my first guess, I’d say this quizz has beaten all contestants. oh, so blame it on me, eh Jochen? As soon as someone guessed a woodpecker for the third, I knew I’d screwed up. Those tail feathers don’t lie.